Gen. Tzvi Fogel: The terrorists have missiles with a much longer range. We need a leader to decide on an operation in Gaza. Retired Gen. Tzvi Fogel, former head of Southern Command, was not optimistic on Wednesday that the ceasefire in southern Israel will last, saying that even if it does, Israel will ultimately have to act in Gaza. Speaking to Arutz Sheva, Fogel reminded that the Gaza-based terrorist organizations have not yet made use of all the missiles in their possession, noting that the terrorists own missiles with a range that could put millions of Israelis at risk. “We’ve warned many times that as long as the smuggling from Sinai into Gaza continues, more and more parts of Israel will enter the range of the rockets and missiles,” he said. Fogel added that in the latest round of fighting, it was not in Hamas’ interest to enter a major confrontation with Israel. Fogel said that despite the tolerance of Israel's citizens in the face of the rocket threat, and the success of the Iron Dome anti-missile system in intercepting the rockets, Israel needs to do more. Earlier on Wednesday, the current head of Southern Command said he isn't sure how long the 'cease-fire' with Gaza's terror groups will last. "There are many different organizations in Gaza and there is no one body that has full control," Maj.-Gen. Tal Russo told reporters. 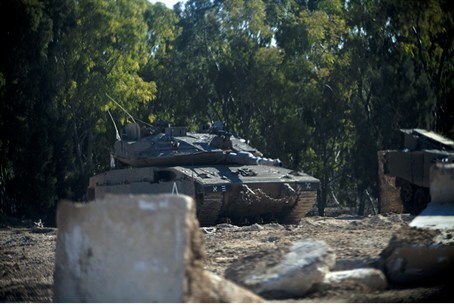 "The IDF is following the events and is preparing for all possibilities," Russo said. "If the silence is broken we have many tools to respond with, and in the last round we did not use them all", Russo emphasized. Despite reports that Egypt had brokered a ceasefire between Israel and the Gaza-based terror groups,late Monday night, terrorists continued to fire rockets and missiles into Israel throughout the day on Tuesday. Just hours after Russo spoke to reporters while touring schools in Israel's south, the Iron Dome anti-missile system intercepted a Be’er Sheva bound Grad missile.